Tortoise belongs to the slowest running animals. It is because of their heavy shell that they can’t run as fast as they want it to be. 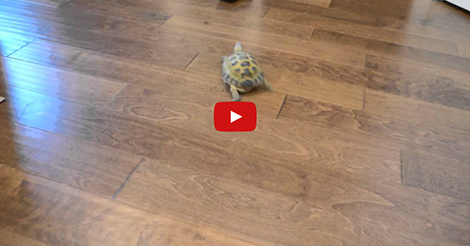 This poor tortoise desperately running fast in the hope of catching up with a remote control truck. He does his best but he can’t still catch the truck. I hope the one’s controlling the truck will give him a chance to catch up. The owner should give the tortoise a break and a gift for working hard! He really looks like he was tired chasing the remote control truck! Exercise In The 1930’s Compared To Now Has CRAZY Differences. Check It Out!